The Clown bike can usually be found in Kansas City, Missouri, USA, on Wednesdays before 8am and after 5pm. Its natural habitat lies within the quadrangle extending from Stateline Road across to Manchester Road and having northern and southern boundaries at the Missouri river and 63rd street. However, it has been seen in a variety of contexts both on- and offroad. 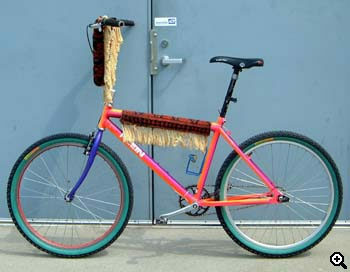 The bike can be readily identified by its unique combination of high-rise handlebars and custom wool fringework (handcrafted from old Persian wool rugs). Those brave enough to put away their pride will find that the Clown bike handles well in terrain of all kinds. The bars enhance the much-loved 'fixed gear feedback' and provide a new experience of sweep and flow through improved lateral control. Riders also report expressions of amusement on the faces of otherwise grumpy and impatient onlookers. The Clown bike's frame is an aluminum Klein Pulse with the sought-after horizontal dropouts. The tires are thick and heavy Continental Traffics which ensure reliable braking and cornering in all conditions. To cope with the many elevation changes in the Kansas City area, the Clown bike is geared at 55 inches. A Thomson seatpost and a Suntour XC dual-clamp stem take care of the stress created by the unusually upright riding position. Finishing touches include zip ties to secure the long brake cable to the bars, a blinky light on the seat post for added safety, and a length of duct tape wrapped around the seatpost for unforeseen emergencies. It is difficult to convey to a skeptical audience the feeling of high-rise bars on a fixed gear. (For comparison, imagine explaining the advantages of fixed gear riding to a gearie.) Those of you wishing to try another flavor might care to equip a 26" or 700c fixed gear with some 14-16" riser bars. Wade Frerichs rides fixed a lot, and is involved in the Heartland Race Series.